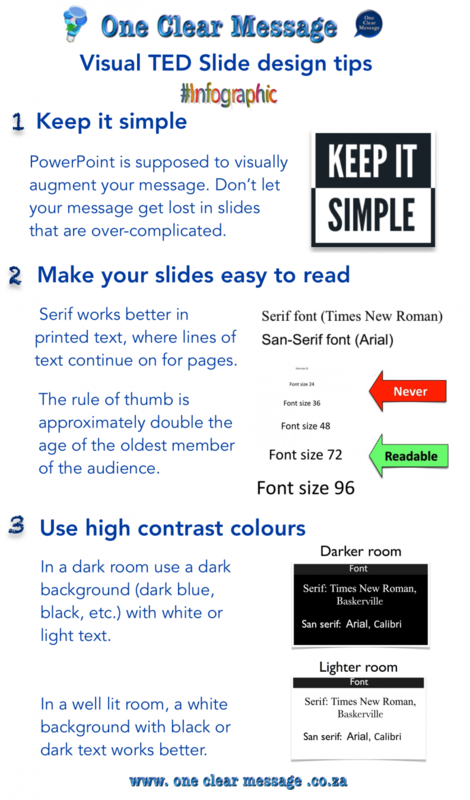 TED slide Design tips from their top presentations. The simpler your slides, the more powerful your message becomes. Top Ted slide design tip. Serif fonts, like Times new Roman, have detail at the end of each letter stroke. Serif works better in printed text, where lines of text continue on for pages. They are not as easy to read on projected mediums, specially with headings. San-Serif fonts, such as Arial, are easier to read on a screen. 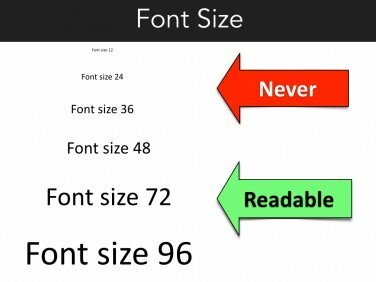 Using the same font set through your entire presentation helps to create a congruent style template, which looks more professional. Always ensure all text can be read from the back of the room (keep age and vision in mind). A rule of thumb is around double the age of the oldest member of the audience. For printed text size 12 works well, but is far too small to read on the screen. 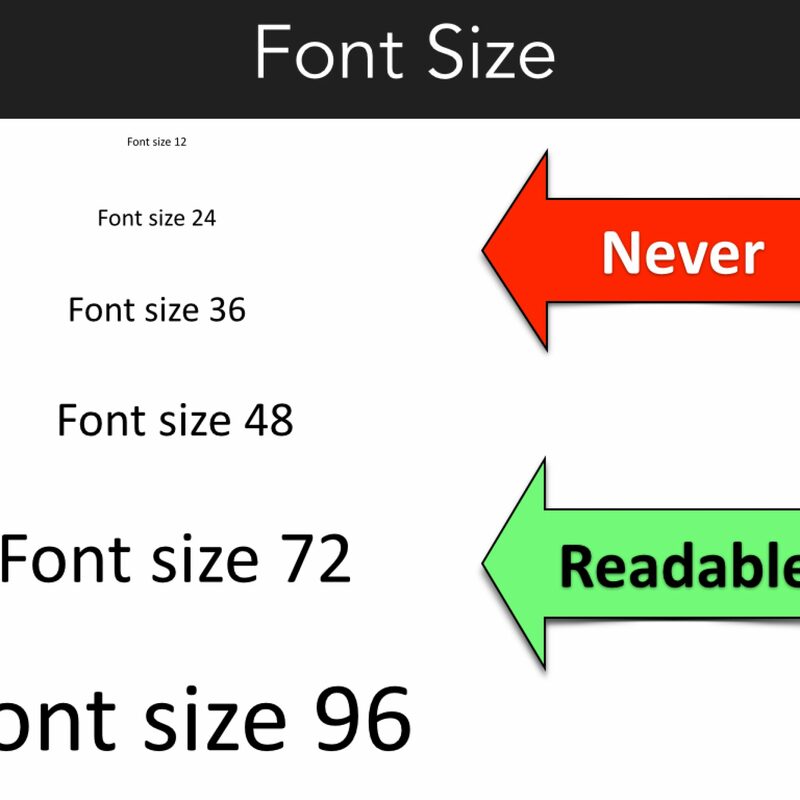 Larger sizes work even better for headings (such as size 96), it also forces you to use less words. Ensure colours are high-contrast, not all projectors display colours perfectly accurately. The colours on the screen may seem different to those on your laptop. Green and red can be difficult for those who are colour blind to see (almost 1 in 10 people). The lighting in the room can also make some colours harder to see. Using a dark colour with a light colour makes the text easier to see. In a dark room preferably use a dark background (dark blue, black, etc.) with white or light text. In a well lit room, a white background with black or dark text may work much better. The slide below has a size 96 Arial font heading with high contrast colours. If you really want to get your presentations right, consider hiring a professional presentation consultant to help. A professional can help you get perspective about what’s important, help you protect your brand and deliver clear powerful visuals which augment your message. If you need help with Ted slide design contact us today.